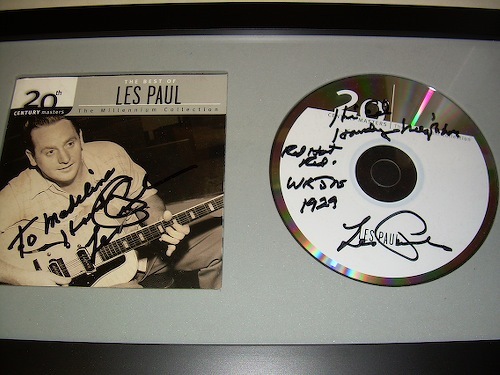 Legendary guitarist/inventor Les Paul has died of pneumonia at age 94. In the past several years, my wife, Madeline, and I were lucky enough to see him on two occasions at the Iridium Jazz Club in Manhattan, where he regularly performed two shows on Monday nights with his combo and guest performers. The above disc and liner notes were autographed after Paul's second late night show. He always signed for free, and beamed upon hearing I'm originally from Racine, Wis. That's why the disc also is signed "Red Hot Red, WRJN, 1929." That was his radio name back then at Racine's signature AM station. Paul was born in Waukesha, Wis., and never forgot his roots. We'll always remember those two nights at the Iridium, where his fingers still seemed to fly through his many indelible arrangements. He also enjoyed bringing young musicians to the stage, asking, "What're we gonna do here?" and then happily playing along as though he were just an everyday sideman. What a terrific presence and inspiration he was, playing nearly to the end of a life lived in full. Here's video of Les Paul playing by his lonesome before being joined by fellow guitar wizard Chet Atkins.